Why do you want to join Tranquility? : I can't and don't really even want to commit to serious raiding or anything like that, and I was looking for some casual company for dabbling in some level cap content. Spotted your post on the server forums and here I am. How often do you play? : Depends how busy I'm at work - sometimes daily but there might be the occasional week when I don't have time to log in at all. When I am playing though, I'm focused and giving it my full attention. What other MMO's have you played? : I played WOW starting from beta for 5-6 years. Technically, Planetside 2 is an MMO and I'm sometimes playing that one, not as a subscriber though. Previous Raid Experience? 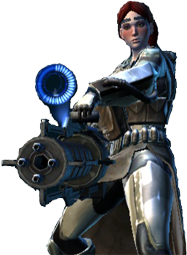 : None in SWTOR. I was tanking for a progression guild in WoW for several years. Grabbed all but one server first during that time and at one point we peaked on some top3 guild lists in Europe. 5 days a week, 5 hours per day, 95+% activity. Can't say I miss it. A little about yourself: Currently I'm a full time researcher at a university, doing a PhD on signal processing, which consumes most of my time and effectively substitutes as my social life and hobbies. When I do find the time to do something else, I'm usually playing on the PC, watching series or hitting the gym. Having spent quite some time in HC raiding in WOW, I'm now quite happy with a casual approach to gaming.